They're not kidding when they say the Swiss are some of the most On-Top-Of-It people in the World. During the exchange orientation session at ETH, the word Eigenverantwortung popped up during one of the slides—throwback to 18.06. This 18-letter word—a combination of "autonomy," "self-reliance," and "individual responsibility"—served as a preemptive warning for us to get our sh*t together learn to become highly-responsible, functioning, independent Adults (if that wasn't already expected of us to begin with). Just for kicks, let's revisit Junior Fall for a sec, and see how all that Eigenverantwortung Adultness panned out. 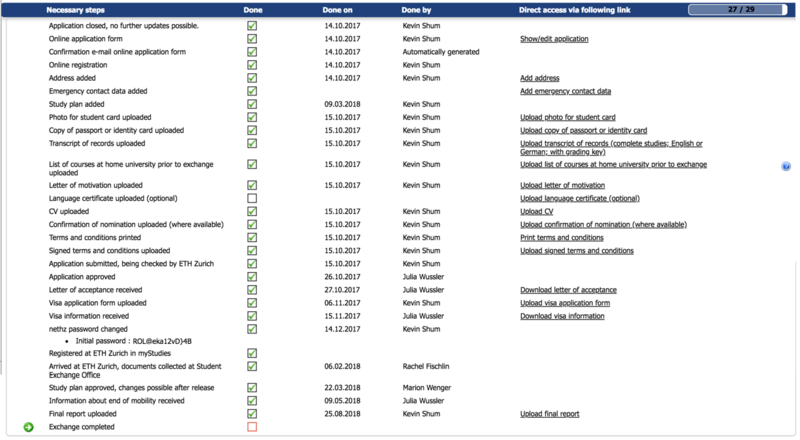 I had received the offer to study abroad at ETH, and all I needed to do was fill out some required forms and I would be on my way to living that dream Suisse way of life. Simple as that. Or so I thought. Pick classes from the course catalog and fill out a study plan and follow all the guidelines. Make a spreadsheet first, of course. Submit my transcript, passport photo, headshot, CV, motivation letter to ETH. Secure a room in student housing from the Housing Office. Register for the intensive German course at University of Zürich. Fill out the forms to acquire a visa and mail my passport to the Swiss embassy. 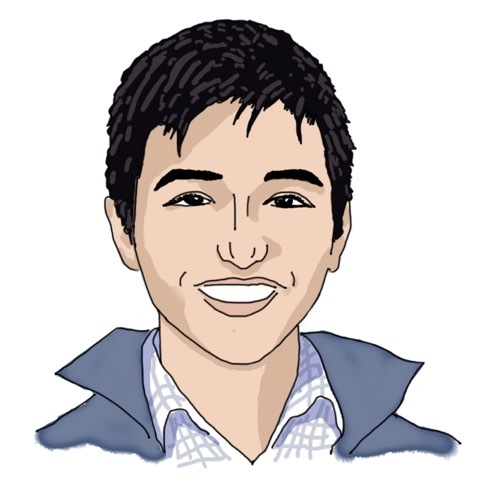 If you receive an email with the subject, "Application academically incorrect," figure out a way to explain that you pre-reg'd MIT-style, putting down more classes than you will take because you have no idea what's going on at ETH and don't know any upperclassmen or Informatik students to ask what the courses are like and hope that the exchange coordinator buys into that argument. Realise that you still haven't submitted your visa application, and on the form it says "Please note that processing your visa application might take up to 3 months," but it's December and you leave for Switzerland in less than 2 months, so you just freak out, but luckily you ask someone who did the ETH exchange the year before but in Course 2, and you are reminded that you're dealing with the Swiss, and they will get things done quickly and efficiently so no need to worry, just send it in now, and throughout the process you bond with the other exchangers in a group chat who are also going through the same struggles and hope you make it all together. Pick up your visa authorisation in the mail, but now you have to send in your passport to the Swiss consulate in NYC, oh, but then you realise that you're going back home in two weeks, and hope that you get your passport in the mail on time because you put down your Boston address, and if not you don't know what you're going to do, like have someone still in Boston mail it to you, but do I know anyone still in Boston during Winter Break? Accept your room offer in one of the student houses and wire the required deposit. Figure out how to do an international wire online, but fail, so scramble to visit the nearest Bank of America to have it done in person and realise there is a $40 or something fee, but what else are you going to do, you waited until the last minute and don't want to be homeless in a new country. When you get your ETH email, forward your mail so that you don't miss anything important. Because you probably will and the administration will have no mercy if you miss a deadline. It's the Swiss you're working with, after all, and everything is ruthlessly orderly and efficient. Receive your passport with your shiny new visa in the mail, thank goodness, because you don't know what you would've done otherwise. Attend the MIT Global Education Health and Safety Workshop just to make sure you realise you're going abroad. Attend the GECD Academic Preparation & Cultural Adjustment Session to really make sure you realise you're going abroad and hope your passport and visa come in time. Fill out the Study Abroad Worksheet which requires getting transfer credit approval from Course 6 and the German department for the German courses to count as HASS classes; meeting with your academic advisor for more approval and signatures; meeting with SFS to figure out tuition billing; meeting with MIT Medical to cancel MIT health insurance because you're getting Swiss health insurance. Then, turn in said worksheet to GECD. Send in a copy of your passport and itinerary to GECD and complete the MIT Travel Registry. MIT has your back in case anything goes wrong. Book your ticket to Zürich! You're almost there! Pack for your next 9 months in one large suitcase and carry on because you won't be returning back to Boston until the beginning of fall semester. Throw the rest of your stuff into storage. Say bye to everyone and hope they won't forget about you or have too much fun without you when you're gone. Arrive in Zürich. Figure out how to get from the Zurich airport to the student house first. And when you take the train instead of the tram when you were specifically told to take the tram then be thankful you have free 2G international roaming thanks to T-Mobile. Finally, meet with the house responsible and check in to your new room. Brace yourself for culture shock with this handy-dandy guide appropriately titled, "How to Deal with the Challenges of Studying Abroad." 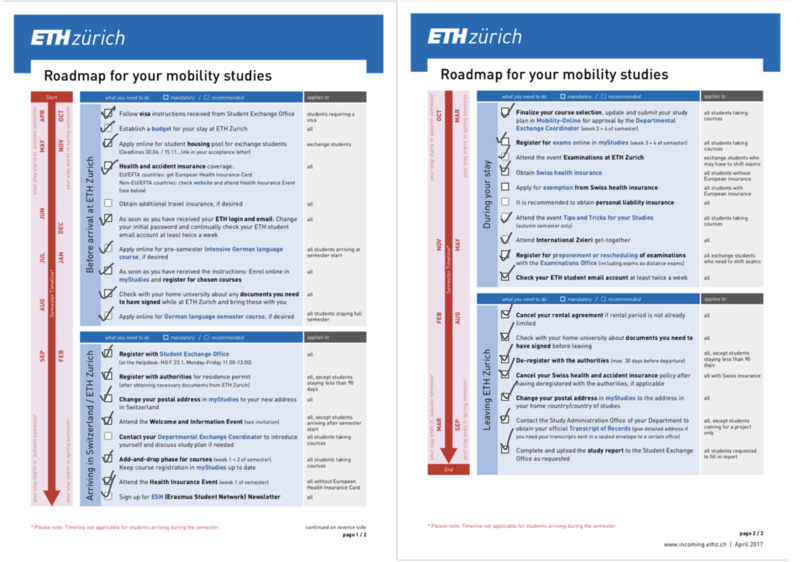 Make sure you pick up your student documents from the Student Exchange Office which contains your fancy new "student card, confirmations of matriculation, a confirmation letter and information for obtaining your residence permit and a lot of additional information on your mobility period and ETH Zurich." Go to the Housing Office and sign some more forms and the rental contract. Register with the local residential authorities and demonstrate that you've come in peace. Make another appointment at another office to get your biometrics recorded before you can receive your Ausländerausweises (resident permit). Pick it up at the local post office when it's ready. 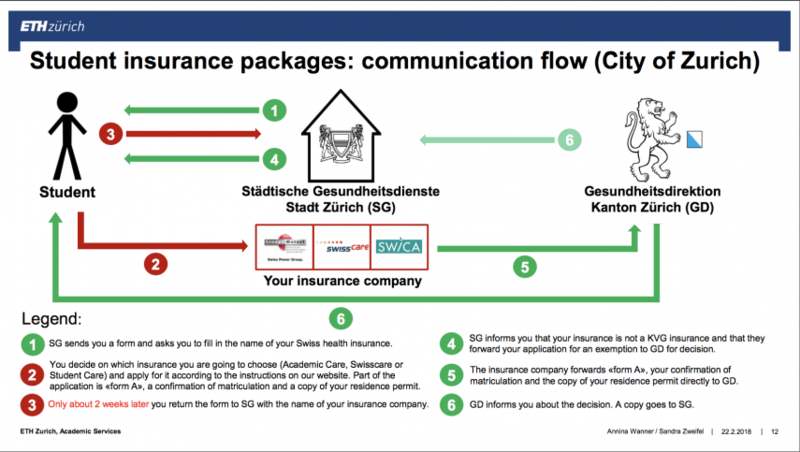 Purchase mandatory Swiss health insurance. Make sure to follow the simple 6-step process (see slide 12) and respond to all the mandatory mail correspondence in German. Decide whether you should get a SIM card or not, but maybe free 2G international data with your family plan is good enough, even if that means you can't really instagram and snapchat any more unless you're waiting 5 minutes for an image to load. Guess its back to snail mail. E i g e n v e r a n t w o r t u n g.
Simply put, I needed to realise that I was on my own. Not just across-the-country alone, but 3-thousand-plus-miles-away-in-a-different-continent-where-im-a-foreigner-and-dont-speak-the-lingo alone. 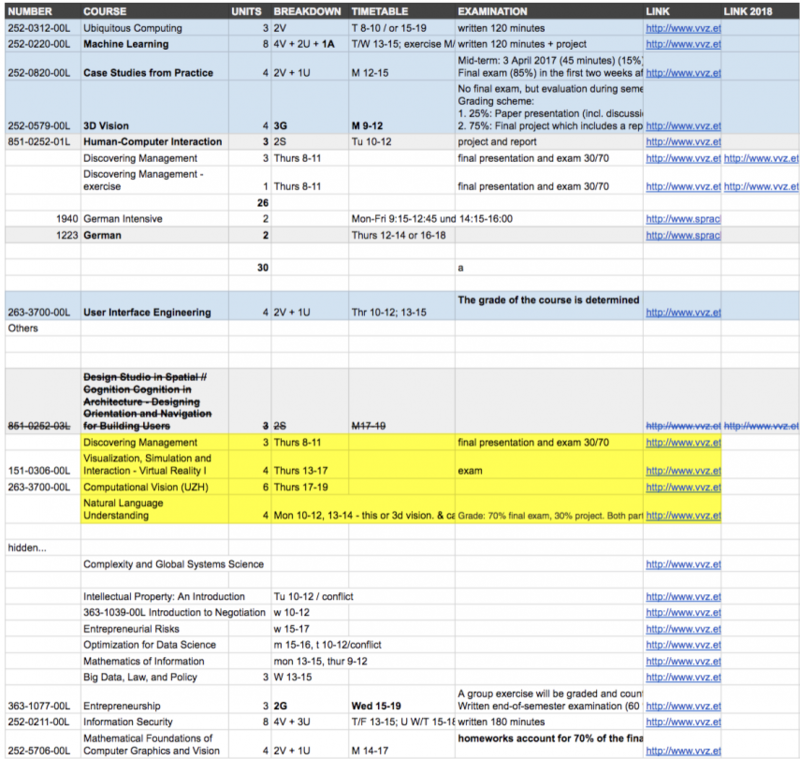 I needed to make sure I could survive and thrive—academically, socially, individually—starting with this todo list. I needed to realise that I couldn't rely on anything that I had at MIT, my friends, or the support system that I have cultivated the last 2.5 years. Not even Amazon Prime or Trader Joe's. I had to quickly become comfortable with being uncomfortable. I couldn't even rely on my study habits and systems I've nurtured since Freshmen year: how to take notes, tackle psets, complete labs, study for exams, attend office hours. Most courses would be graded solely on your performance on the final exam. One shot, 100% of your grade. No psets, participation grades, midterms, labs, projects, or any other sources of structured accountability that we're used to at MIT. There wasn't going to be much in terms of extracurriculars, clubs, organisations, campus culture, dorm culture; no RAs, GRAs, academic advisors, or S3. Student life would be fundamentally different. Everything was going to be different, for better or worse. I needed to, in many ways, reinvent myself, to brace myself for culture shock. Eigenverantwortung was the Swiss take on Mens et Manus. Without the spoon-feeding or sugar-coating, ETH expected each of us take initiative and embrace our newfound autonomy. But with individual responsibility came freedom and independence. I was now in control of my own schedule, to form my own community and support network, to prioritise my responsibilities, to learn on my own, to apply the theory in whatever way that suited my learning style best. As long as I could grasp the material and write the exam, everything else was left to our own devices. 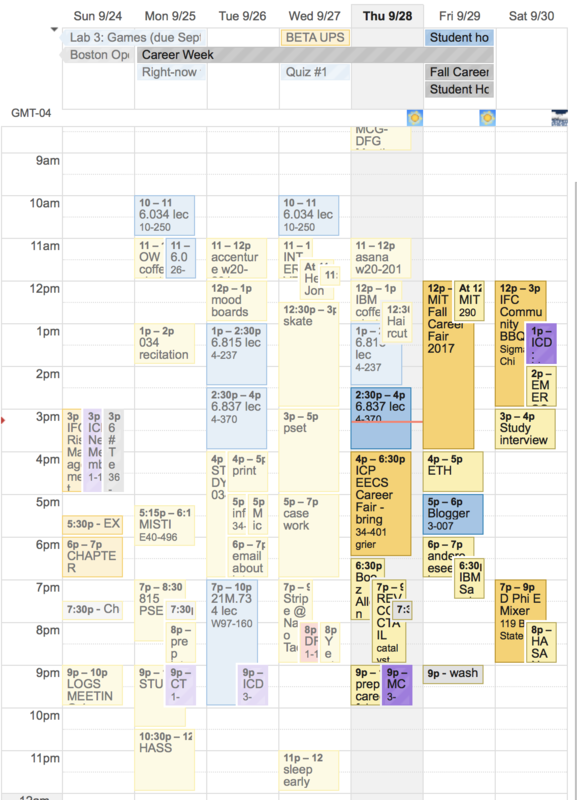 I had the perfect opportunity to design and engineer the semester into whatever I wanted out of it. Only one of my courses, Intro to ML, had tutorials (recitations), psets, and labs, but the psets weren't graded and the labs were only there to help boost your grade on the final. Human-Computer Interaction was a seminar-style course, in which we read research papers and each week different groups presented on a different topic. For that seminar, along with 3D Vision, another project-based course, our final grade depended on a weighted sum of our presentations, final project, and final paper. 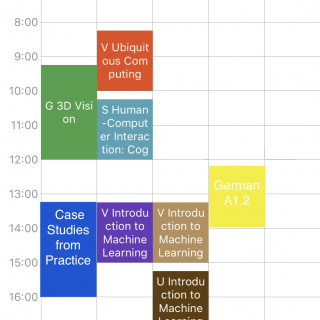 I had traditional final exams for Ubiquitous Computing and Case Studies in Practice. For German, we were given a very manageable workload of weekly assignments and lists of vocabulary to memorise, verbs to conjugate. 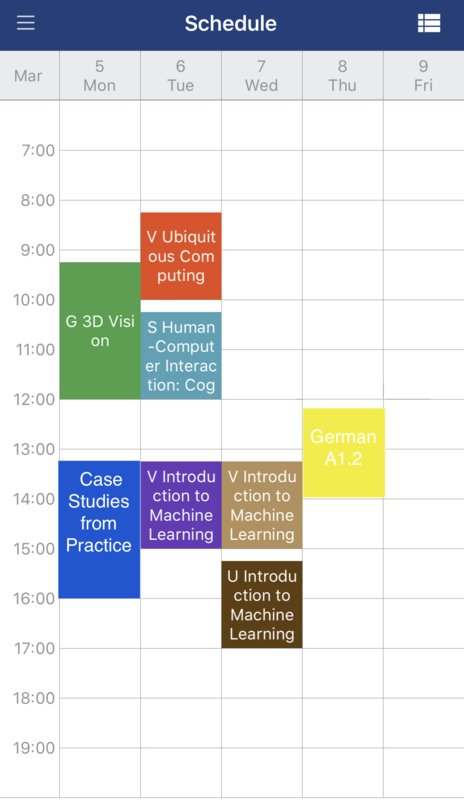 My course timetable—a mere 16 hours of lectures a week (ETH-time is quarter-past). At least 56 hours for sleep (8 hours/day! ), 24.5 hours for cooking and eating (3.5ish hours/day), so roughly 71.5 hours free to manage the rest of my life, studies and all. At first I wasn't quite sure what to do with my newfound Free Time, a concept I only guiltily indulged in from time to time and lied to myself about because I never really do have Free Time. I looked for research positions, extra courses, part time work, clubs, and societies to fill that void. But I thought back to the one promise I made to myself before I left: embrace your once-in-a-lifetime opportunity to step away from all of my responsibilities and obligations, and do whatever you can to protect that Free Time and keep that schedule as free and open as possible. I wanted to have a spontaneous, stress-free semester. I wanted to appreciate my time at a new school, in a new country. I wanted to appreciate being a college student for once. The easy way out, though, was to load on more things. I was scared of being bored. Being busy was natural for me, saying Yes instead of No. But I forced myself to stay true to my promise. Just one semester for yourself, you owe it to yourself. Some people have asked if I experienced FOMO, spending over 9 months away from the 'tute and the people that make it special. Well, yes, I did miss my friends, but I would see them when I get back.  Everything happening on campus would be more of the same—I'd been through 5 semesters of MIT already. The Real Answer: honestly, no, I didn't miss any of it, not at all. I barely even thought of MIT. More importantly, though, I didn't have 3 psets due in two days, 100 pages of reading to annotate the next morning, a paper to finish at midnight, a project deliverable and two midterms the next week. Add in to the mix serving as chapter president for my fraternity, continuing my UROP from the summer, recruiting for a Junior summer internship that spanned over 50 job applications and many more interviews more often than not ending up in rejections, training for the skating season trying to qualify for the US Championships, dealing with injuries and mental and physical fatigue. That semester, I was trying to juggle so many things and multitask every hour, micromanage every waking minute of the day, that everything got inextricably intertwined. I had grown increasingly out of touch with myself, enslaved by the rigidness of my calendar and todo lists, always worrying about what was next, the future instead of the present. I was trying to do it all, but not doing any single thing well. I was on the verge of burnout—I don't know how much longer I would've lasted. Looking back, the only way I survived throughout that hot mess of a semester was with the glimmer of hope. The hope of liberation, that if I could hold out just a little longer, I would be able to walk again, not be forced to sprint. I had been disillusioned with what my life at MIT had become. Studying abroad was my way out, my saving grace. It was the best excuse to step away from it all. Once in Zürich, I could finally breathe, hear myself think, reflect. It was a new school, new country, new year, new adventures, new me. It was time to finally take it all in—one moment, one adventure, one memory at a time. A burden lifted, I was smiling more, laughing more, shoulders relaxed. With freedom and independence, no longer under constant bombardment of stress and looming deadlines, I could get my revision and coursework done during the day, and then spend my weekday nights exploring the city, take a Super Kondi workout class, go on long walks, pop in to local shops, skate whenever I wanted to, read a book, go hiking in the Alps, get to know an incredible array of Swiss, international, and exchange students, cook meals with friends, attend Zvieri in the middle of the day, visit different festivals like Fasnacht and Sechseläuten, take a dip in Lake Zürich, enjoy the sunset on the rooftop. On the weekends, I could travel and explore Zürich, hop on the train to visit cities like Lausanne, Lucerne, or Basel, or even other countries nearby, like bordering Italy, France, Austria, and Germany. I could study hard, work hard, and afterwards, truly relax, unplug, and recharge without a worry. The Swiss heavily inspired me, too, to take on a new approach to balancing my academic and social spheres. They know how to take their time, enjoy themselves, balance their lives with work and leisure, get things done, pace themselves for the marathon of life, not the sprint to death. No wonder it's one of the happiest countries in the world, so much so that many famous authors have taken refuge in the majestic Swiss alps for creative inspiration (anyone remember Frankenstein?). Work-life balance is a cultural expectation here. The two concepts aren't mutually exclusive, like a "school, sleep, social life—pick 2" sort of deal at MIT. Sundays, for example, you will find everyone outside, lying on the grass, enjoying their meals outside, dipping their feet in the river, reading a book, catching up with friends over brunch or coffee, throwing frisbees, hosting a picnic or barbecue, going skiing or hiking. Almost every shop and business is closed on this day of rest, 24 hours truly set aside for rest and regeneration, Free Time intentionally carved out for the masses. I could get used to that. Now that I'm about to start Senior year, I'm coming back to MIT recharged, reenergised, reoriented. My first taste of liberation from overcommitment and burnout has shown me that it's possible to take advantage of all the opportunities college has to offer without overworking or stressing yourself out to the brink of insanity. My self-worth isn't tied to all the things that I do, all the things that I achieve. As a trained engineer, I had been optimising for the wrong parameter: for work throughput, not our own selves. There's always more to do, more to see, more to learn. I will never be able to do it all. But that's okay. It's fundamentally human. Instead, I can be happy and content and find meaning and value even in slowing down. I can approach MIT differently. It doesn't have to always feel like the masochist version of IHTFP. Yes, MIT may be one heck of a firehose, but can't I step slightly away from the nozzle? I just need to pick and choose my priorities, to be intentional about how I want to spent my time, how much water I consume. This is but the start of my career. I don't need to kill myself before I even begin. I have a perfect opportunity to start try to MIT again, more sustainably this time. It might've taken 3,743 miles and 5 semesters to figure that out, 5 semesters of self-imposed overcommitment of saying too many yes's, of trying to do it all, of nearly burning out, thinking that I would take pride in being as hosed as humanly possible, stretching my limits to its limits, thinking I'd grow that way. But I think I get it now. For me, it's a whole new mindset. Eigenverantwortung isn't just about checking one more thing off of your todo list as a Strong Independent Adult. It's also about the obligation to myself to take a pause, to reflect, to be deliberate in action and inaction. To find clarity amidst the noise, peace in the quiet, myself in the process. Yin with the Yang. I still keep too many todo lists, but I'm not letting them guide my life. Sign up for the Erasmus Student Network and request a ESN mentor buddy! Make sure you have the student house kitchen and bathroom cleaning schedules marked down because if you miss a cleaning night you're punished with two additional ones. Message your skating friend who you met at a competition in Slovakia two years ago, who happens to have grown up and trains in Zurich. Ask her to introduce you to her coach and secure ice time while you're in the country. Remember to drop any exams you don't intend on taking. 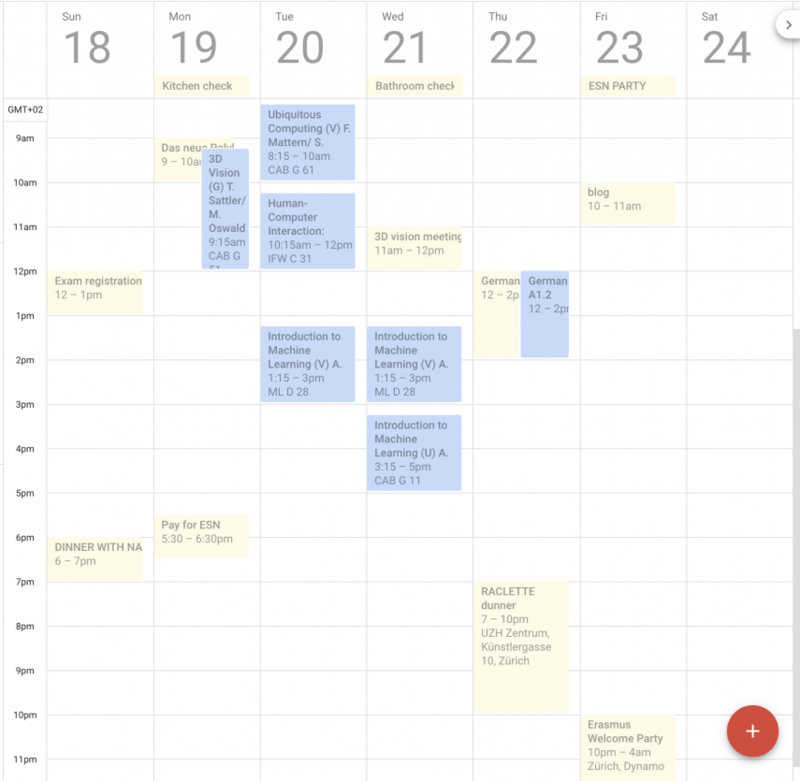 Figure out how to prepone exams because you already signed your life away for a summer internship in the US and can't take session exams in the month of August, schedule TBD, but somewhere in the 4-week time frame. First read through this handy-dandy 9-page document. Realise that an internship is not a valid excuse for ETH to prepone exams (most students end up staying on campus and study throughout the summer). Email Anne Hunter for help—she has your back, like always, and gets you the letter you need. Once you get the approval from the Examination Office, one of your professors refuses to prepone a written exam because that would mean re-writing an entire final just for you and having one of the professors fly in from Austria just for you. Ask to take a distance exam and hope your intern manager will be okay with that. Figure out how to get the exam proctored come August, but that's future-you problem. Buy a transport pass to get around Switzerland at half price and free train travel after 7pm. Figure out how to find a doctor when your ear gets clogged for a few days and you freak out but luckily there is this lovely service called International SOS that has your back and finds a doctor for you who miraculously unclogs your ear and all is well again. Set up a bank account because you need to pay your rent and bills in Swiss francs and it would probably be better to have access to cash and ATMs and not have to constantly pay exorbitant exchange rate and ATM fees with your US bank but realise that most Swiss banks refuse to open an account for you because you're American and they don't want to deal with you but luckily there is one bank that would be happy to take your money and business and they are super nice and professional and even serve you sparkling water and Swiss chocolate while they process your account and paperwork. Figure out how to sublet your housing because you'll be leaving after classes are over but you're forced on a 6 month lease because it aligns with the 6 month semester (hey, you're supposed to still be there studying during the summer). Interview a few people and host a showing and pick the one you think will keep your room clean and do the kitchen chores or else you lose your deposit. Of course, there are more forms to fill out and turn in. Plan a spring break trip with your new exchange friends to travel Europe but struggle to agree on an itinerary and then decide to travel on your own and meet up with another MIT exchange friend who's studying abroad in London. You've preponed your exams, so buy a return ticket home! When you're about ready to leave, deregister from the authorities and tell them you're leaving the land of Swiss cheese and chocolate and have them revoke your residence permit. But before you go, pay some more money to get a piece of paper confirming with your mandatory Swiss health insurance that you're actually officially legitimately leaving with the Swiss government stamp of approval so you don't pay any more for monthly premiums. Set up your bank account to receive back your housing deposit, assuming all goes well with your subtenant. Remember the exam you have to take in August? Figure out how to get that proctored and send some emails back and forth to get some more signatures from your professors and the Examinations Office and the proctoring service. Pay for this exam out of pocket and for some reason no one will cover this expense (hey, you're supposed to still be there studying during the summer). Cancel your travel pass or else you'll have another year of half-price transport in Switzerland. Maybe the perfect excuse to go back? Write up a study report, and arrange to have your transcripts sent back to MIT and figure out how to get transfer credit…more forms, more signatures, more paperwork, TBD. Begin your Senior fall 5 days after your exchange term officially ends.